India’s housing property market recovered after seven long years in 2018. Along with higher sales, the inventory of unsold houses touched a new low. These positives were largely driven by the government’s incentives for affordable housing. According to global property consultant Knight Frank, which analysed trends across top eight cities, “60% of the new launches in 2018 were within the ₹50 lakh bracket, or the affordable and mid-range segment”. Another trend in the last two-three years was increased offtake in tier II and tier III cities. Property prices were, however, range-bound across most cities. Some regions such as Mumbai even showed a drop. As a result, while sales volumes grew, the per-unit metrics was stagnant or showed a slight decline. Therefore, analysts have turned cautious about the financial impact of the shift among developers towards affordable housing. A study of 25 listed real estate companies by CARE Ratings Ltd shows that the revenue grew by 11.3% in the first half of FY19 over the year-ago period. Sales bounced back from the previous year’s low base, when sales were impacted because of regulatory hurdles and increased compliance under the Real Estate (Regulation and Development ) Act. But, that didn’t help profitability. 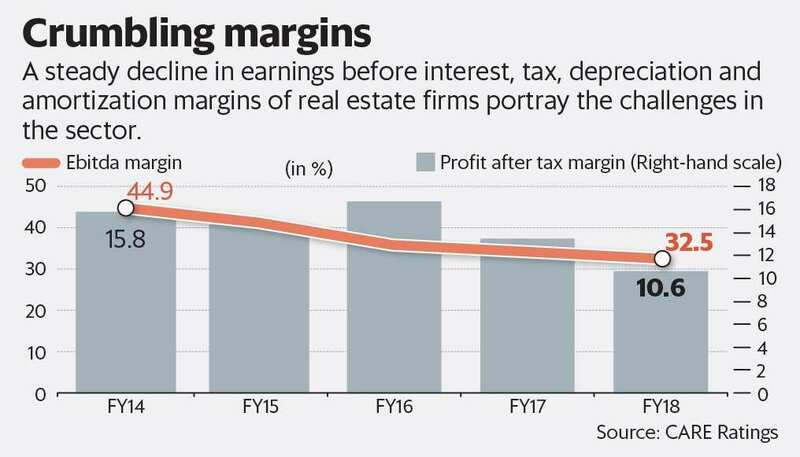 On the contrary, CARE Ratings data shows that Ebitda (earnings before interest, tax, depreciation and amortization) margins contracted by 230 basis points during the period under consideration. “With affordable and mid-segments typically enjoying lower margins, the trend in future could be higher sales, but lower profit margins,” says the report. A basis point is one-hundredth of a percentage point. This comes on the back of a contraction in Ebitda margins in previous years as well. Earlier, the reasons were a slump in demand, which led to large discounts and a supply overhang. Meanwhile, there are uncertainties such as outcome of the general election, the impact of the recent non-banking financial crisis and its impact on real estate demand. These factors may keep property prices weak for the next three-four quarters. The rout of the BSE Realty index is therefore not surprising. It is down 32% in the past one year, even as the benchmark BSE 500 index has fallen 7.5%. In this backdrop, it’s the realty companies, which are focused on commercial properties, that are better placed. Here, lease rentals are rising and demand growth continues to be robust. Investors too are backing real estate firms that have a greater exposure to this segment compared to the beleaguered housing segment.